A classic San Diego dish, Carne Asada Fries are so delicious and super easy to make at home. Learn the tricks from a local San Diegan. Yesterday I sounded like a scorned wife, and it had nothing to do with anything my husband did. My team, the Los Angeles Chargers, were in the playoffs and as much as I loved seeing them there, I am still completely ticked off they left my beautiful San Diego. I know, it’s completely ridiculous that I am not over it yet. As I am sure you can tell, I love San Diego with my whole heart and soul. Like any city it’s not rainbows and rose petals all the time. The cost of living is bonkers and freeway driving, although not as bad as Los Angeles, can be a harried experience. However, what we do have are gorgeous sunny days, mild temperatures, beautiful beaches, the biggest small town feeling while living in the big city you will probably find on the west coast and AWESOME Mexican food. Needless to say, San Diego is where the classic Carne Asada Fries recipe was invented. It is like the best of Old Town restaurants married an In and Out Burger and a beautiful baby was born. 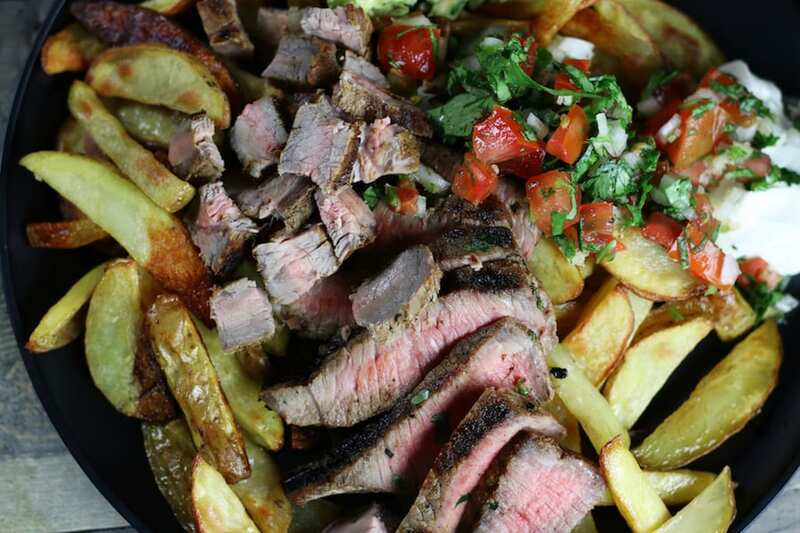 Making the best Asada Fries really comes down to using quality ingredients and recipes. 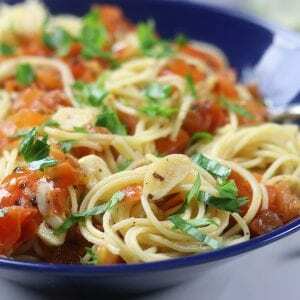 Mouthwatering flavor is the main objective and here are the crowd pleasing recipes I have used time and time again. 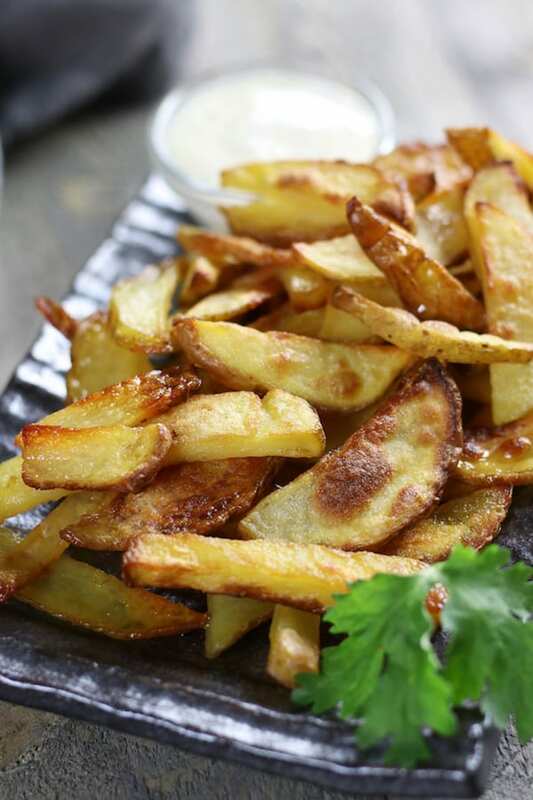 Homemade French Fries– There is something so delicious about using fresh potatoes with a quality oil that has your own spices on it. These are a crispy oven baked fry with the perfect amount of seasoning. 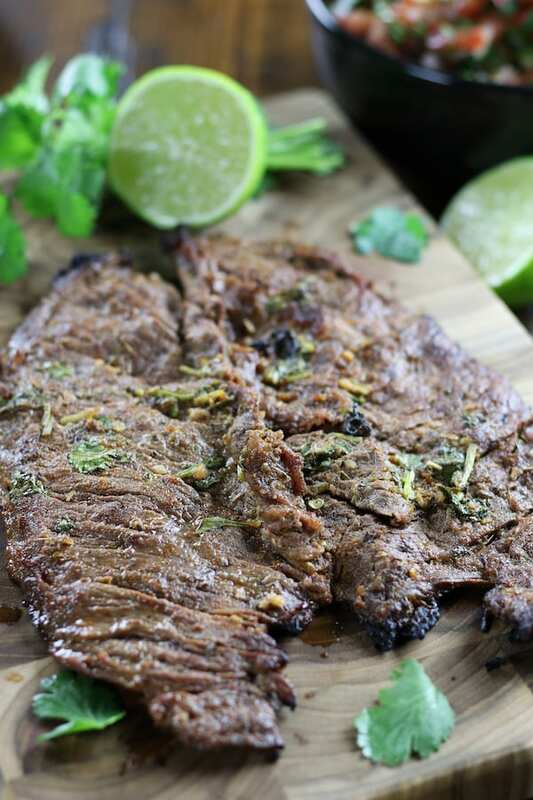 Carne Asada– AMAZING Carne Asada meat is what makes this meal so divine. 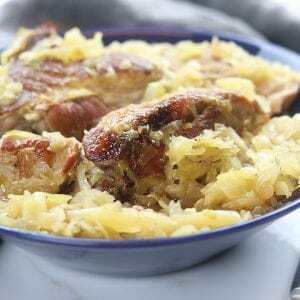 This recipe breaks down all the How To’s along with the best cuts of meat for you. Plus it has a To Die For marinade. 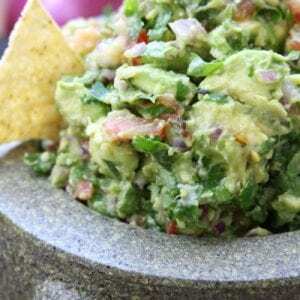 Guacamole– The only recipe I use for guacamole is the one that my husband swears has ruined him for all others. It’s fresh, simple, healthy and completely addictive. Pico de Gallo– One of the simplest Mexican recipes to make and it adds such a fresh and zesty touch to all kinds of dishes. Sour Cream or Plain Greek Yogurt– Creamy and cool, either of these choices adds a wonderful addition to this French fry dish. Are Carne Asada Fries gluten free? 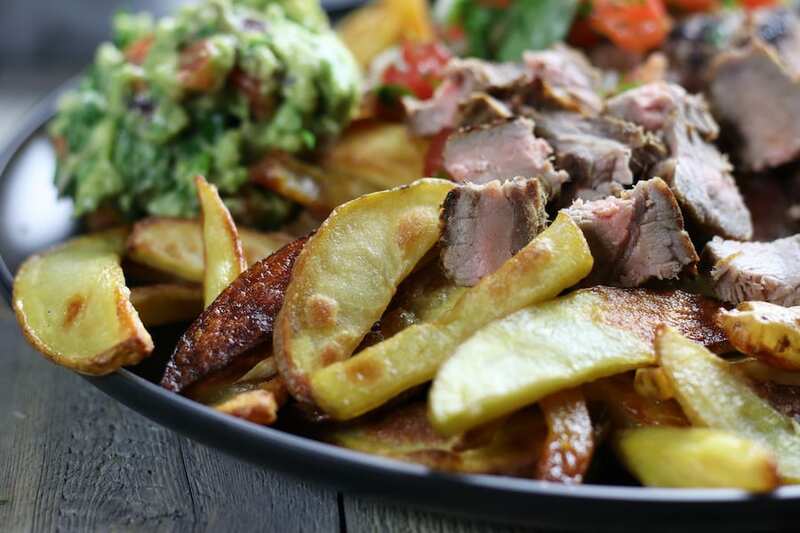 Yes, these homemade Carne Asada Fries are gluten free when using the attached recipes. If using prepackaged items, read labels carefully to ensure there is no hidden gluten within the ingredients. What kind of cheese is best for Carne Asada fries? Queso fresco, homemade nacho cheese or pepper Jack would all be amazing on these fries. Just know though that there is no right or wrong cheese. That is the beauty of home cooking. You tailor it to your own personal preferences. 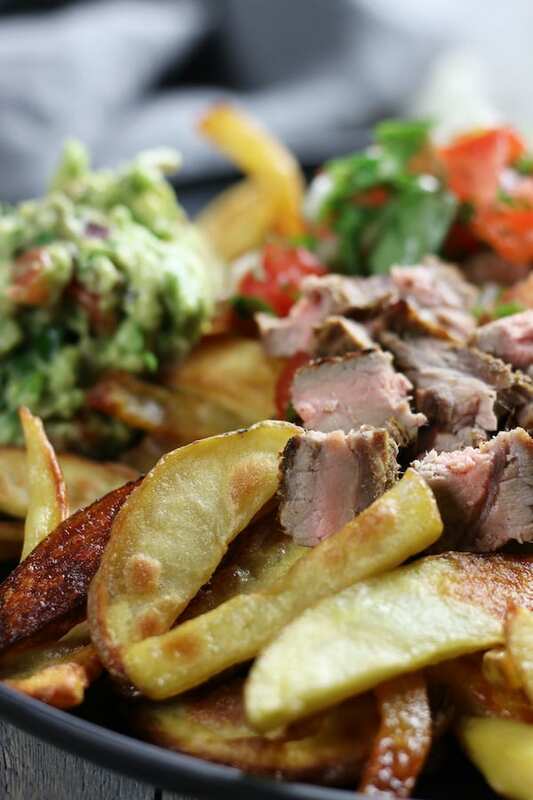 How do you reheat day old fries and Carne Asada meat? Preheat your oven to 400℉ . 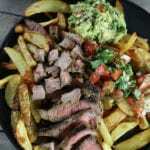 Place a single serving of fries in a round cake pan and layer the cut Carne Asada meat on top. (If using cheese layer also.) Bake for about 10 minutes or until fries and meat reach desired temperature. Pro Tip: Making sure to not over crowd the pan will allow for fasting reheating. Are Carne Asada Fries also considered to be California Fries? Yes and no! It all depends on who you ask. Go to most restaurants outside of California and if they have California fries on the menu chances are they are going to be very similar to Carne Asada fries. There is a version of California fries out there that comes with crunchy shoestring fries, melted cheese and thousand island dressing. Carne Asada Fries are such a mouthwatering meal for game-day, family night or as an appetizer. 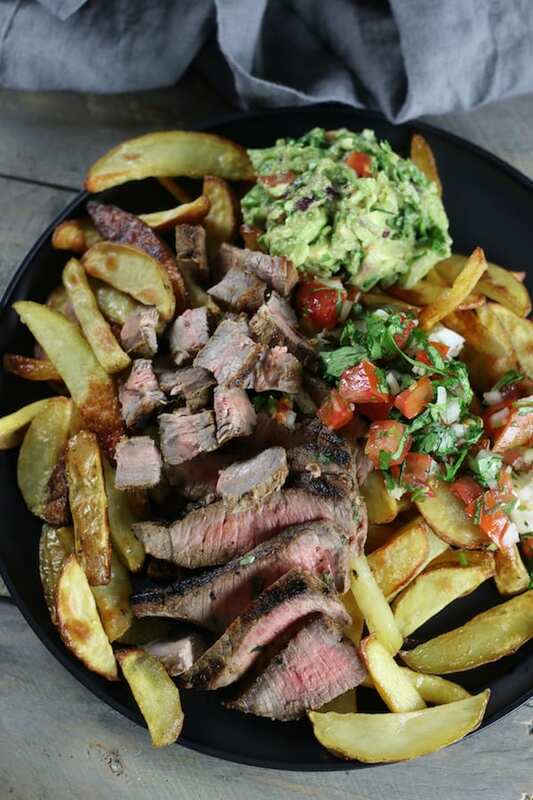 Crispy baked homemade french fries are topped with the most juicy and flavorful Carne Asada meat and then topped with the Best guacamole. 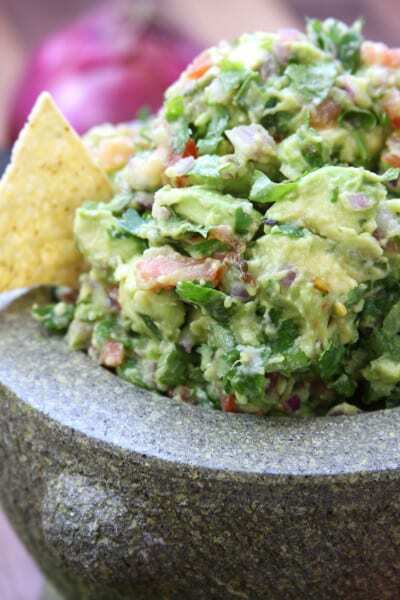 Prepare Simple Healthy Guacamole according to directions in recipe and refrigerate until needed. 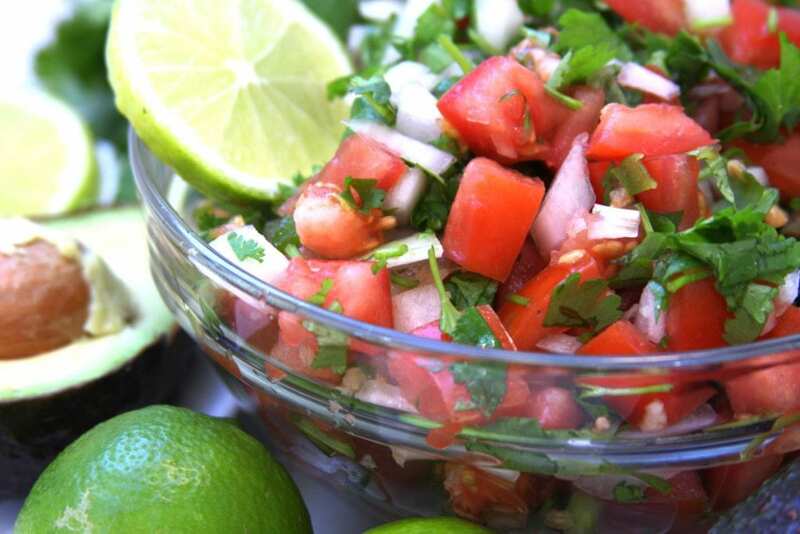 Prepare Pico de Gallo according to directions in recipe and refrigerate until needed. Prepare Homemade French Fries (or fries of your choosing) according to directions within recipe. Prepare Carne Asada meat according to directions in recipe. *Please take note of marinating times for the meat cut of your choice. Place a layer of fries on a plate. Top with Carne Asada, guacamole, pico, sour cream and queso. **Preparation time does not included marinating time of Carne Asada and salt bath for potatoes.